I've long documented my love of the split 7", both as a way to discover new bands and as a way to pair like minded folks for a quick little burst of music. I can't say that my favorite split 7" gimmick is when the two bands cover each other's songs. Though I don't really mind it when each band contributes one original and then the cover songs. The Weezer / Wavves split 7" is not like that. On the Wavves side, you only get a less than two minute long cover of the Weezer song "You Gave Your Love To Me Softly." Now, as far as Weezer songs go, that's a pretty great one, but Wavves doesn't really do anything to make it their own. Sure there is a little bit of surfy echo during the "La la la" part of the bridge, but other than that it's a pretty paint by the numbers cover song. It's good, but just not particularly interesting. 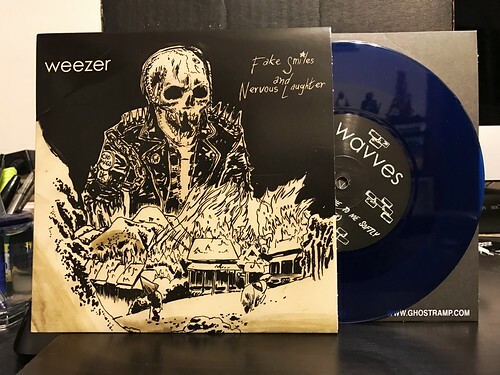 The Weezer contribution is one original song called "Fake Smiles and Nervous Laughter." Compared to a lot of the band's post-Pinkerton output, it's a pretty solid song. It's a low key, mid tempo rocker that doesn't really build to anything in particular, but kind of doubles down on the melodies they've worked into the verse. It would have fit nicely on their more recent album Everything Will be Alright in the End. It's certainly better than anything I heard on that new White Album of theirs. Still, I can't really recommend this as an essential pick up. It's really meant for completists, either Wavves or Weezer collectors. For casual fans, it's an easy pass.